Welcome to another addition of Coasters-101. Today we’re going to discuss one of the most important and perhaps most overlooked components of a roller coaster-the foundations! It’s an exciting time when you go to your nearest amusement park and see holes in the ground. This is a sign that foundations, more commonly referred to as “footers”, are being dug and a new ride is about to be installed. Let’s look at some of the engineering principles behind the design of a roller coaster’s concrete foundation. Don’t worry; you won’t need an engineering degree to understand these basic concepts. The main engineering principles to understand here are tension and compression. When a specimen of material is loaded in such a way that it extends the material then it is said to be in tension. Conversely, if the material shortens under axially directed pushing forces it is said to be in compression. The capacity to resist such forces is called compressive strength. When the limit of compressive strength is reached, materials are crushed. When a coaster train is rolling down the bottom of a hill it pushes the track downward causing a compressive force on the foundation of the structure due to the weight of the train and the positive gravitational forces acting on the ride. When a coaster train flies over the top of a small hill that provides airtime and even negative g’s the wheels on the underside of the train actually want to pull the track upward. This upward “stretching” of the structure is a tension force. If these forces are too great they may cause the foundation to crack. What does this have to do with footers? The main material in the foundation is concrete, which can have a very high compressive strength. While concrete is strong in compression, it is weak in tension. However, steel is strong under forces of tension, so combining the two elements results in the creation of a very strong foundation. This is called reinforced concrete. Steel is embedded inside the concrete in such a manner that the two materials act together in resisting forces. 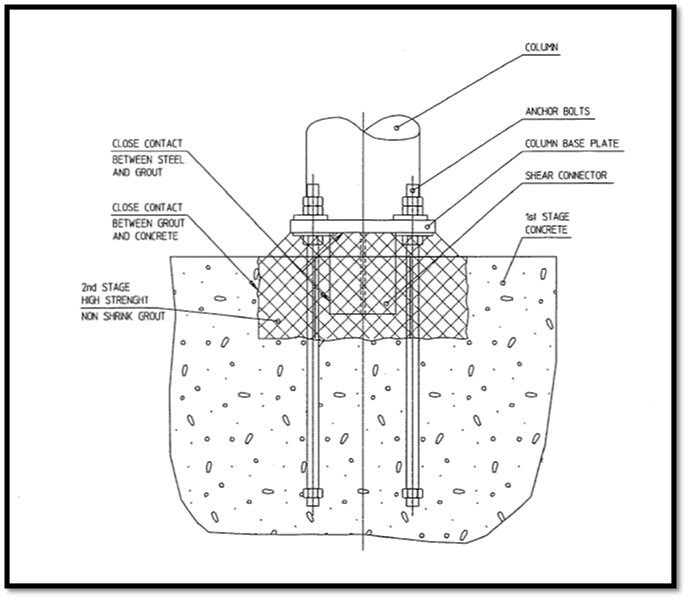 Compressive force is transmitted to the foundation through perfect contact between the column base plate and the grout. 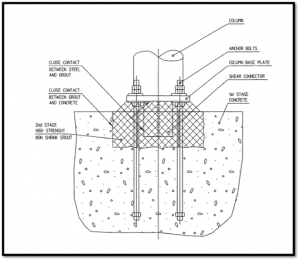 Shear force is transmitted to the foundation through perfect contact between the shear pin and grout as well as between the anchor bolts and grout. Tension force is transmitted to the foundation through the anchor bolts. To learn more about how coasters are designed check out Coasters 101: An Engineer’s Guide to Roller Coaster Design. Looking to train maintenance department at Raging Waters Theme Park- San Dimas Ca. Going to order your 101 book to start off and go forward from there. We are having a new large scale roller coaster built starting in a few months. I want to get the employee up to date on troubleshooting and mechanic of a roller coaster. If you can help or guide me please inform.. Thank you..